Pure maple syrup! Minnesota Grown! Family owned. Award-winning. Licensed and inspected! Located on the Star Lake Peninsula in Otter Tail County, Minnesota. Pure sugar-maple sap is collected from over 1300 taps using a gravity tubing collection system. We use only clean, commercial, food grade equipment. 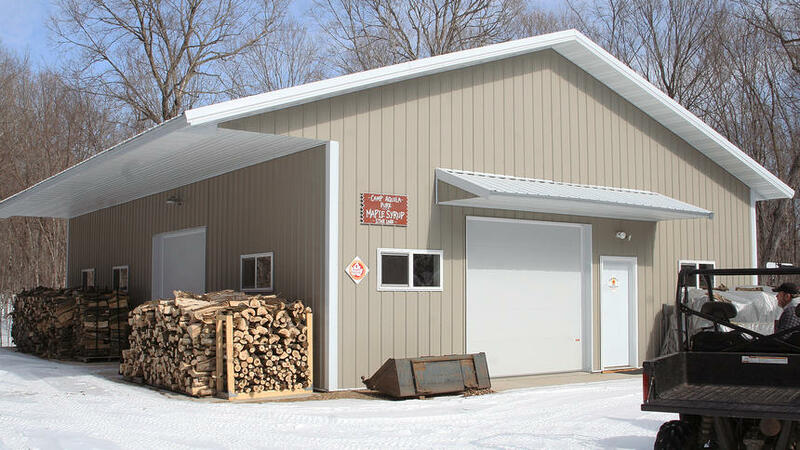 We boil our fresh sap as soon after collection as possible on a CDL wood-fired continuous-flow evaporator. Attention to detail is the key. Our goal is to be one of the best "small" producers of flavourful, high quality pure maple syrup. We sell primarily through area retailers and restaurants. Support the fine merchants listed on the Buy Our Syrup page. Limited access to our facility. Sorry, retail farm sales and tours are limited and by appointment only. Call 218-758-2796.